GarageBand boxApple Inc, since its acquisition of Emagic and their flagship sequencing program Logic Audio has been pushing customers to try out their talents with the entry-level GarageBand sequencing software. The software package boasts many professional sequencing features but remains very simple to use. In this way it can attract people unfamiliar with similar audio software. It is especially useful to live instrument musicians who like to do little of their work arranging music on a computer and more of what they do best, live performing and recording music. Create tracks with separate sounds, edit the notes and synchronize everything at your desired speed. Record live instruments and play back with the rest of the tracks. As simple as that. On the technical front GarageBand amongst other has all the basic features for creating or recording tracks, basic controls for velocity, panning and sound volume per channel. There are three views of the software package, one that shows the channels, one for the instrument descriptions and one for the score. The score view enables you to edit in many modes including the popular 1/4, 1/16 and 1/32. Keeping everything on one screen makes life simpler and easier as you never lose focus of the final goal, which is completing a track fast with all the original inspiration inside. GarageBand is expandable and Apple offers many packages for sound and instrument upgrades from a very wide range of styles. 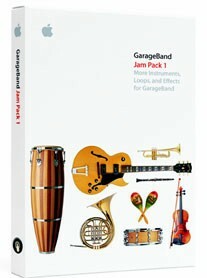 From the GarageBand Jam Pack series "World Music", "Remix Tools", "Rhythm Section" and "Symphony Orchestra" stand out as the most interesting. This is no rocket science in terms of features and processing power, however do you think it's equally hard to write a simple quality program that introduces the masses to audio sequencing?